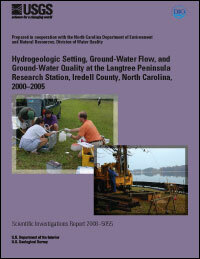 A 6-year intensive field study (2000–2005) of a complex, regolith-fractured bedrock ground-water system was conducted at the Langtree Peninsula research station on the Davidson College Lake Campus in Iredell County, North Carolina. This research station was constructed as part of the Piedmont and Mountains Resource Evaluation Program, a cooperative study being conducted by the North Carolina Department of Environment and Natural Resources and the U.S. Geological Survey. Results of the study characterize the distinction and interaction of a two-component ground-water system in a quartz diorite rock type. The Langtree Peninsula research station includes 17 monitoring wells and 12 piezometers, including 2 well transects along high to low topographic settings, drilled into separate parts of the ground-water-flow system. The location of the research station is representative of a metaigneous intermediate (composition) regional hydrogeologic unit. The primary rock type is mafic quartz diorite that has steeply dipping foliation. Primary and secondary foliations are present in the quartz diorite at the site, and both have an average strike of about N. 12° E. and dip about 60° in opposite directions to the southeast (primary) and the northwest (secondary). This rock is cut by granitic dikes (intrusions) ranging in thickness from 2 to 50 feet and having an average strike of N. 20° W. and an average dip of 66° to the southwest. Depth to consolidated bedrock is considered moderate to deep, ranging from about 24 to 76 feet below land surface. The transition zone was delineated and described in each corehole near the well clusters but had a highly variable thickness ranging from about 1 to 20 feet. Thickness of the regolith (23 to 68 feet) and the transition zone do not appear to be related to topographic setting. Delineated bedrock fractures are dominantly low angle (possibly stress relief), which were observed to be open to partially open at depths of as much as 479 feet below land surface. Well yields ranged from about 3 to 50 gallons per minute. The connection of fracture zones at depth was demonstrated in three bedrock wells during a 48-hour aquifer test, and drawdown curves were similar for all three wells. General findings of this study help characterize ground-water flow in the Piedmont and Mountains ground-water systems. Ground-water flow generally is from high to low topographic settings. Ground-water flow discharges toward a surface-water boundary (Lake Norman), and vertical hydraulic gradients generally are downward in recharge areas and upward in discharge areas. Dominant water types are calcium-bicarbonate and are similar in all three zones (regolith, transition zone, and bedrock) of the ground-water system. Results of continuous ground-water-quality monitoring indicate that ground-water recharge may occur seasonally over a period of several months or after heavy rainfall periods over a shorter period of a few to several weeks. For more information, please contact Melinda J. Chapman.